Safety on the road is a major concern not only for traffic officials but indeed for all road users. There are many different road safety campaigns aimed at reducing road deaths and injuries on the roads of South Africa. The most well-known of these are the Arrive Alive Road Safety Campaign and the Make Roads Safe Campaign. 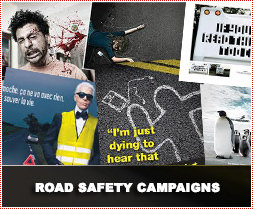 Several NGO’s have also focused on road safety through several of their own campaigns. These include South Africans Against Drunk Driving, Drive More Safely etc. Businesses in South Africa have thrown their weight behind special initiatives such as the Pick and Pay Stay Alert Stay Alive Campaign, Imperial with the I-Pledge Initiatives etc. The alcohol companies have for a number of years been running road safety and anti-drunk driving initiatives. SAB launched a No Regret Friday Initiative in 2011 while brandhouse has managed the Drive Dry Campaign for a number of years. The Road Traffic Management Corporation (RTMC) launched its 2012 festive road safety campaign on the 20th of December in Pretoria. "Get there. No Regrets" is a new campaign from the RTMC against carnage on the country's roads. The campaign focuses especially on drunk driving and head on collisions mainly caused by reckless overtaking. It is reported that 40% of people who die on the country's roads are pedestrians. About 60% of both pedestrians and drivers are under the influence of alcohol. 33 percent of people who die on roads are passengers. Just 2% of passengers buckle up. The RTMC says their new campaign aims to bring positive change to these figures. The new campaign sought to encourage motorists to be responsible and finish their journey without any regrets. The new campaign is hard-hitting and would most likely hit closer to home. During the launch, an advert that was to begin airing on television and radio was played. The ad deals with the aftermath of reckless driving and the consequences that accompany accidents. “Anybody who is wishing for a safer journey must think about the consequences and what happens when you don’t adhere to the rules of the road,” said Letsoalo. He said at least 40 people a day died on the roads and the only way to get the message across to people was to show them the harsh realities of what was happening. Letsoalo said if all motorist buckle up, 2013 can see a 30% reduction in road accidents and 50% by 2015. Authorities have called for motorists and passengers cooperation to achieve this goal. The safety massage will be broadcast on various television, radio and print media advertisements to create awareness. The RTMC also reintroduced the road safety mascot, Danny cat, teaching children about road safety and traffic rules. “We want to be in your face and bring it close to people. We are going back to schools and the streets. Now we are going back to doing things such as stopping and inspecting cars instead of only using cameras,” said Letsoalo. He said the road safety message would be taken to schools and children taught awareness from a young age. Letsoalo said the RTMC had a memorandum of understanding with the Department of Education to make road safety part of the school syllabus. He said this was not strictly a festive season campaign but an all-year-round attempt to change driver behaviour on the roads.